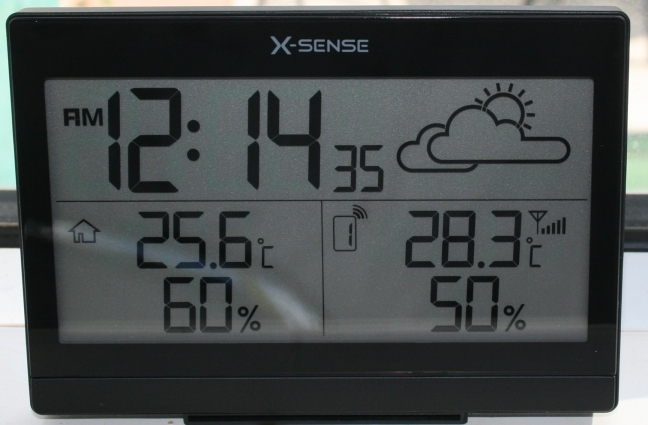 I have had one of these two part indoor and outdoor weather stations in the past, the ones with the transmitter which sends temperature and humidity details to a clock stored inside. They are really quite interesting as you get two readings showing the temperature inside and outside of your house. You could place the transmitter in the greenhouse for example, to see if it was too hot or too cold in there – you don’t have to limit yourself to simply placing it in the garden. 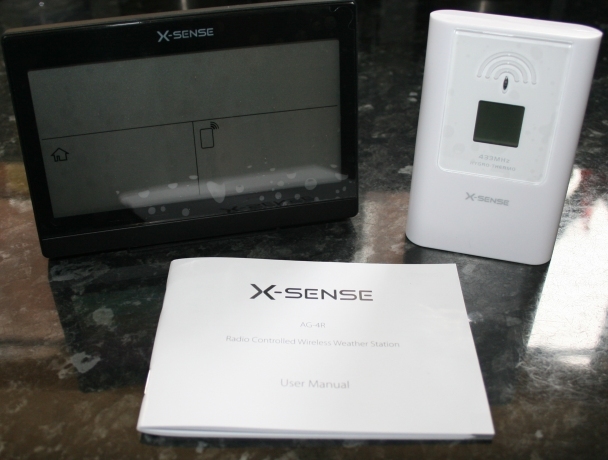 If you get one of these x-sense versions, you can get extra sensors for the station and place them at different locations – one in the greenhouse and one just in the garden for example. Another use for an additional transmitter could be in the conservatory – so that you can know if it’s too hot without actually going in there. Then, you can go and open the windows! Ok – lets go over the LCD weather station I have got my hands on. You can see that the product comes in two different parts – the main unit which is situated indoors – on a fireplace for example or somewhere else where you can see it and (if using the alarm) hear it beeping. The second part is the outdoor transmitter which should be placed outside in a location where it does not got hit by glaring direct sunshine as this can affect the temperature reading. Ideally, you want it in light shade, with good air circulation so that it can read the humidity and the temperature of the air rather than the suns scorching rays. The outdoor part of the device sends its recorded data over a wireless signal every 15 seconds back into the reciever of the main part. 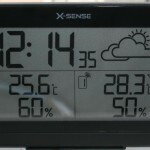 The main LCD display will then show the figures as transmitted by the outdoor sensor. This gives an almost real-time update of the weather conditions outdoors and allows the computer in the indoor part to calculate and make some basic weather forecasting predictions for the next 24 hour period. These are reported as being around 70% accurate. Two batteries of type AA are required for EACH part of the weather station, so four in total. Although I use rechargeable batteries, I get the impression that normal batteries are more suited to this kind of constant use device as they seem to last longer, but I don’t have actual duration figures available at the time I am writing this review. Home Weather Station Transmitter Features. Other features include a clock which gets its time from an atomic clock in Germany DCF77, so there is no need to set the time manually – it simply recieves the time pulse and keeps itself set. 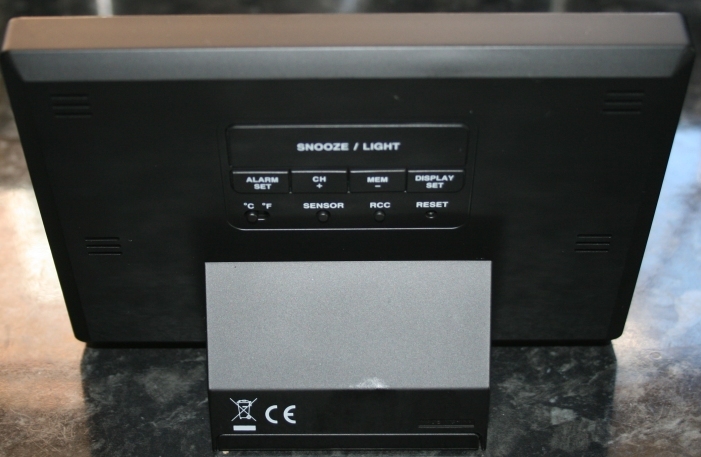 A backlight which is activated via a button on the rear lights up a pleasant orange colour for clear night time reading of the digital display showing time and weather details on the LCD screen – this is automatically switched off after around 5 seconds to preserve the battery power – so please note that it is not on all the time – you cannot expect a battery operated clock to be lit up constantly like the mains powered models which are plugged in constantly. An alarm can be set and this also has a snooze function which is handy for those moments when you first wake up but want another 10 minutes lie in! Both temperature and humidity are sensed for the locations of the sensor and the main unit itself, so for a kit with one sensor/transmitter, you will get indoor and outdoor readings from two locations in total. There is an ice symbol which lights up to warn of ice if the outdoor temperature drops between 3 degrees and -2 degrees c. Maximum and minimum records are held and can be reviewed at anytime – this is useful because you will be able to record the hottest and coldest days of a given period. To keep things tidy looking on the front, all the control buttons are on a panel on the reverse. Notice that you cannot hang this on a wall, as the battery compartment protrudes and also acts as the stand for sitting it on a flat surface. The buttons are fairly easy to understand, and all the set-up functions are accessed through the respective click button. CH+ for instance will, when pressed, scan for readings from transmitters on upto 3 different channels and display the data on the front along with the currently selected channel number. For your reference, I have shown an image below of the sensor in operation with the indoor part of the kit. Although for display purposes I have placed the two side by side, the range is around 50 meters, so even on very large gardens you will get a good reception. Bear in mind to keep both items away from anything which could interfere with the transmission – such as a metal plate. 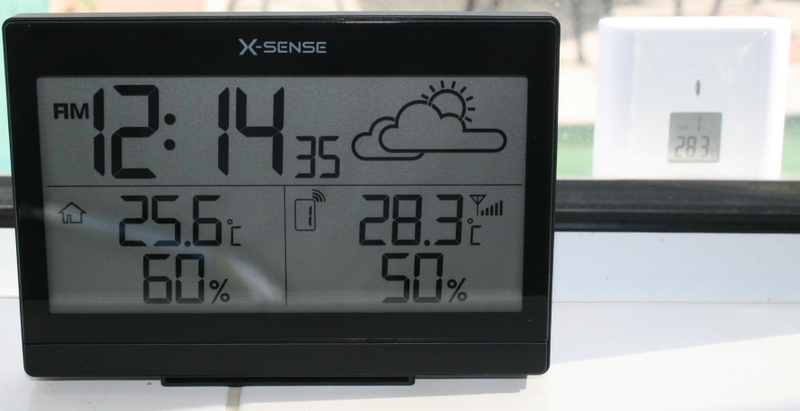 Below you can see that the indoor display is in sync with the outdoor part, as the latter has a small window on it which displays the currently measured readings (latest readout). This is a lovely looking gadget which I have enjoyed reviewing and I would recommend it to anyone wishing to purchase a weather station for in their own home. A word of caution – personally I want my transmitter to last a long time, so I like to place them in an area which is covered by a roof of some kind. My suggestion is inside a bird table perhaps – or under an overhanging roof or gutter so that the rain cannot fall directly onto it. Also, if the battery compartment does wear and leak – this will ensure the batteries are kept dry, you don’t want them getting wet or they themselves could leak and cause damage to the transmitter.